1. 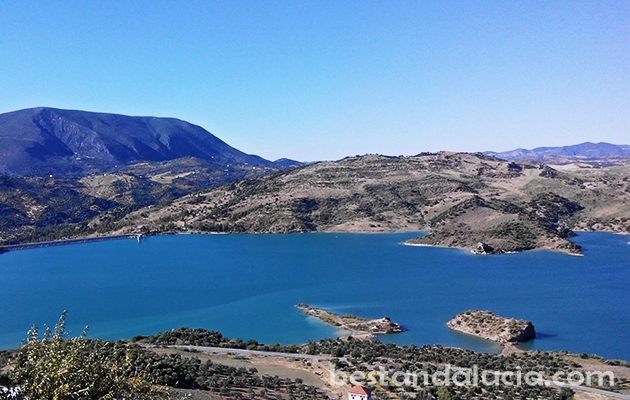 Bermelejales lake – located 30 kilometres south of Granada, close to Alhama de Granada, Embalse de los Bermejales is a much recommended idyllic place to spend your free time. It’s a massive lake with a shoreline as long as 28 kilometres! There are some great beaches there with shallow water, perfect for kids. It’s possible to rent kayaks or peddle boats at the lake. Good quality camping is also possible in the woods near the lake. Bermelejales lake is a great place for jogging, cycling or hiking in the nearby Sierras de Tejeda natural park. 2. 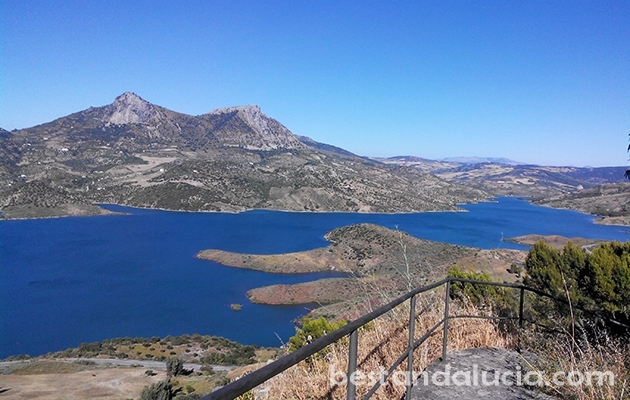 Zahara lake – beautiful reservoir located picturesquely in the mountainous region of Sierra Grazalema natural park. The tranquil white village of Zahara de la Sierra towers over the turquoise waters of the lake. Splendid panoramic view of the lake is available from the ruins of Zahara’s fortress. Great place for canoeing, sailing, kayaking as well as fishing. 3. 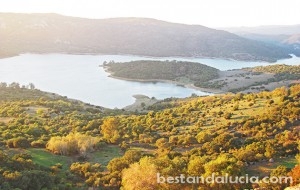 Iznajar lake – the Iznajar reservoir, located 80 kms inland from Malaga, is the largest lake in the whole of Spanish Andalucia. Great view of the lake is available from the Moorish castle in the village of Iznajar built on top of a huge rock. Tranquil Iznajar lake is surrounded by beautiful olive groves. Interestingly, the lake is spread across three provinces: Malaga, Cordoba and Granada. Fishing, sailing, windsurfing and canoeing, is popular there in summer. 4. Arcos lake – reservoir located near Arcos de la Frontera. Popular among swimmers and fans of water sports in summer: kayaking, water skiing or sailing are permitted there. Also popular among bird watchers. 5. Lake Vinuela – located 10 kilometres inland from Velez-Malaga in the Axarquia area. Popular among canoeists. At the southern end of the lake there are some nice picnic zones. The lake area boasts some nice walking routes as well. 6. Bornos lake – close to Arcos de la Frontera near the village Bornos. Very popular among paragliders and windsurfers. Also a great spot for fishing, rowing or canoeing.